We are your wholesaler for concentrated oils, body oils, burning oils, air fresheners, and much more! We also manufacture aroma lamps, guaranteeing you get the best wholesale pricing available. COMPARE OUR OILS. WE GUARANTEE YOU'LL COME BACK. Mad Style is your go-to source for wholesale men's apparel, fashion accessories, handbags, jewelry, men's gifts, accessories and more. Print on demand customization, localization, personalization. We are a great source for trends on fashion clothing, accessories, jewelry and custom items for men and women! 70. Haven Place USA, Inc.
Haven Place USA is a manufacturer-direct supplier for vacuum packed and boxed memory foam mattresses, hybrid spring mattresses, memory foam mattress toppers, heavy duty steel slat bed frames, metal faux leather and wood folding beds, bedding sets, and massage chairs. 72. MVP Trading Co., Inc.
Wholesale distribution and export of branded health and beauty aids, personal care items, household cleaning products, automotive and more. Brands include: Gillette, Nivea, Crest and many more. Please visit our website to view our catalog or call our office at +1-516-204-7793 for more information. Manufacturer of "JUST DARLING COLLECTION". Importer & Wholesaler of Over 5,000 Products: Childrenswear, Accessories, Shoes, T-Shirts, School Uniforms, Christening Wear, Formal Wear, Baby Goods, Christian & Hispanic/Mexican Products, Baseball Caps, Bridals, Rhinestone Jewelry, and Hosiery. We design and manufacture our products in our Southern California warehouse. We offer large discounts to volume buyers. High-end quality pillows for more than half of retail price (MSRP $50-$75) GREAT PROFIT POTENTIAL. We also have large CLOSEOUT stock. SPEEDY TURNOVER RATE FOR ORDERS. FREE LOCAL DELIVERY! Contact us for appointment and quotes! 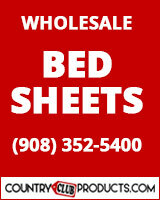 We are a Importers/Wholesaler of Bed Bath and kitchen Textile products. Selling our product line of Tufted Bath Rugs, Cotton Blankets, Cotton Throws, Towel sets, Beach Towels. We are specialist in selling wholesale towels at heavily discounted prices to provide super value to you and your customers. Been in business since 2003. We are a direct importer for a wide variety of product lines including baby products, ultrasonic aroma diffusers, diffuser necklaces, car diffuser, fashion accessories, fans, heaters, photo frames, letter openers, key chains, crystal collectibles, strollers, bicycles, tricycles, toys and more. TEXSTYLES DECO manufactures and distributes the largest selection of tablecloths and placemats in North America. We regularly enrich our collections with new, exclusive creations and colors that reflect the season's latest trends. We are the proud manufacturers of solid rustic pine furniture and signs. Whether you're looking for wood benches, wall shelves, kitchen hutches, mudroom storage, or decorative wall signs, we've got it all! Everything we make is constructed of solid knotty pine, and built in our shop in Eau Claire, Wisconsin.